I know I’m always coming to you guys with some new favorite dish or other, and I realized I might be starting to look like the boy who cried wolf. So let me assure you there’s less hyperbole here than you think. My passion is food, and when I get really excited about something, the first thing that comes to mind is that I want to share it with all of you! This plant-based panna cotta is one I started as I was getting ready to go cook for a vegan client. Most of the time, cooking vegan is about making a dish as close to the meat/dairy/egg containing original as possible, and it’s an art I’ve gotten pretty good at over the years. Most of my creations taste just fine whether you follow a vegan or carnivorous lifestyle, and there are some that are good enough to fool most meat eaters. But it’s pretty rare when a vegan dish transcends its limitations and makes something that tastes amazing regardless of how you chose to live your life. This vanilla panna cotta is one of those singular dishes that will be getting made a lot in my household. It has a texture a bit like freshly made silken tofu, but without the intense soy flavor or astringency. It’s satiny smooth as it slips past your lips and then proceeds to melt into a rich pool of creamy bliss in your mouth. 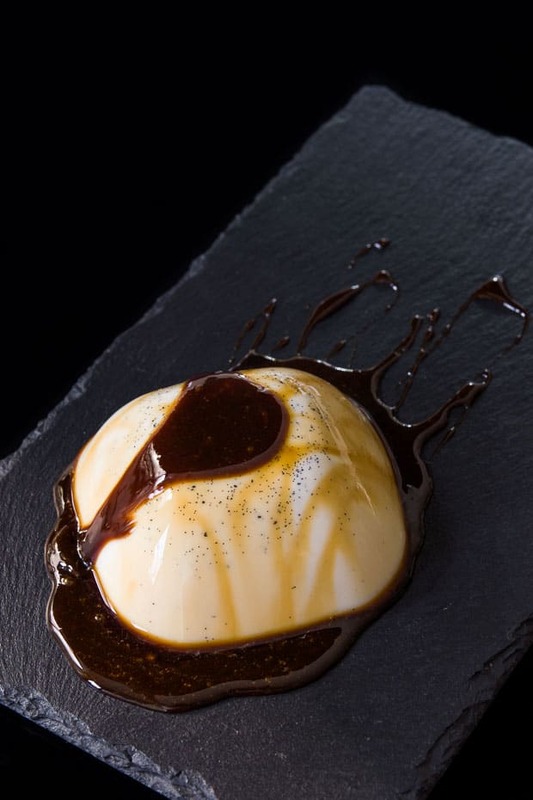 The incredible texture is punctuated by a starfield of fragrant vanilla beans, and the black sugar syrup not only sweetens the pudding, it provides layers upon layers of intense caramel, fruit and molasses notes that turn a simple dessert into something truly extraordinary. Contrary to popular belief, most brown sugar sold in the US is simply processed white sugar that’s had some molasses added back into it. Black sugar, on the other hand, is sugar cane juice that has not been processed to remove any molasses, resulting in a sugar that’s coffee brown with all the nutrients and minerals of the original sugar cane from which it came from. Depending on where you are in the world (or where the sugar came from), it goes by many different names, including molasses sugar, dark muscavado, kokutou, chancaca, and piloncillo. I’m not going to make the argument here that it’s good for you (it is sugar after all), but I love it because it tastes amazing. Perhaps the best part of this vegan panna cotta is that it’s not just ridiculously good, it also checks the “stupidly simple” box as well as the “not terrible for you” box. One serving suggestion: this dessert is so smooth, the thick sauce slides down the sides of the shiny dome like a Porsche 911 GT3 on black ice. That’s why I’d recommend either pouring the black sugar sauce over the vanilla panna cotta at the table or put the sauce in a small vessel and let people pour it themselves. 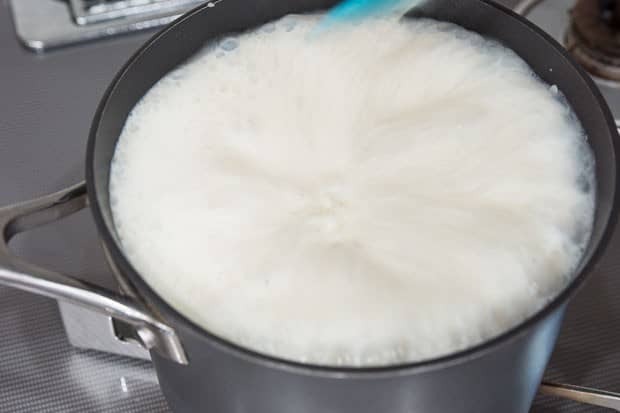 Add the soymilk, agar agar and sugar to a pot. Split a vanilla bean and scrape out the seeds putting both the seeds and the pod in the pot. Heat over medium-high heat, stirring constantly until the mixture comes to a rolling boil. 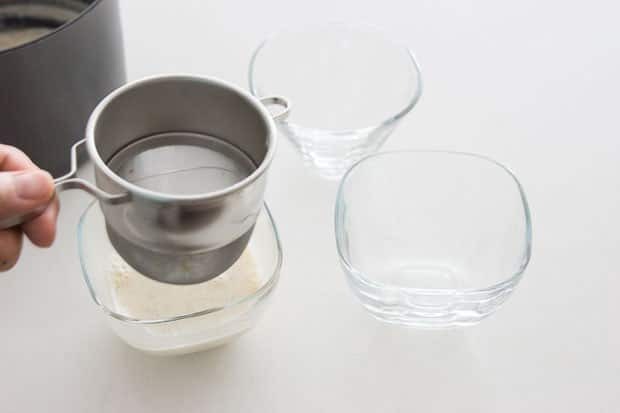 Divide the soy milk mixture into small ramekins or bowls, passing it through a tea strainer to remove any chunks of vanilla or coagulated soy proteins. 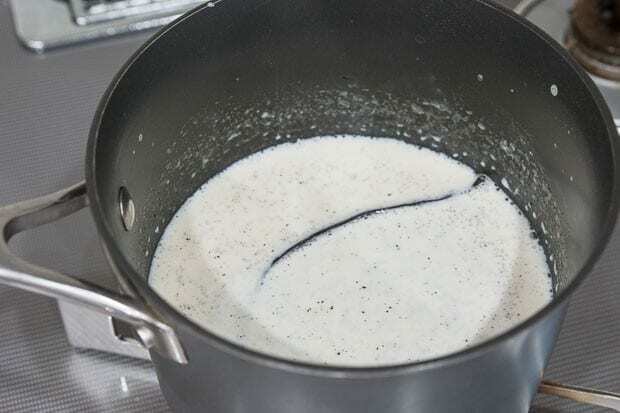 To make the black sugar syrup, add the sugars and 1 tablespoon of water into a small pot and heat until the mixture comes to a boil and the sugar has dissolved. If your sugar is not in powder form (i.e. it comes in chunks) you'll need to use more water to dissolve the sugar first and then reduce it until it forms a thick syrup. Let the syrup cool. To serve, you can either pour the syrup straight into the ramekins, or unmold the panna cotta first and then drizzle the sauce on top. Please read the ingredients on your agar agar powder (it should only include agar agar). Apparently, some brands mix sugar and other ingredients into their powder which will make it set differently. Yummm…this looks SO GOOD! Thanks for sharing! Is evaporated cane juice a liquid or powder? It’s the technical term for unprocessed raw sugar (i.e. sugar cane juice that’s been evaporated into crystals and then ground into a a powder).